It is Thanksgiving 2012 and Max turned 6 last week. He had a fun party with his friends at the Pump It Up in Sunnyvale. Max is in Kindergarten at Juana Briones School in Palo Alto and his teacher is Lanette Trooper. He has many new friends. His buddy is Kamran and he likes to play with Noa, Levy, Leilani and Lulu (Lulu is moving back to Bejing on Sunday). Here is Max with Leilani and Lulu after their first assembly performance in Kindergarten. In May Max started to learn Karate at the United Studios for Self Defense in Los Altos. He now has the yellow belt and participated in his first tournament. And finally here is a great picture of Max with my boxing gloves. 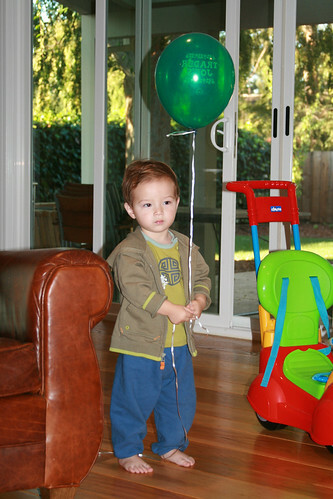 Happy Birthday – Max is 2! Wow, how time flies. Two weeks ago Max turned 2. We celebrated at home and today (Thanksgiving) we have another small birthday party with the Grandparents Linda and Warren, Aunt Becky and Uncle Kevin. Max loves Thomas the Steam Engine so he really enjoyed the large Thomas wooden train set he got from the grandparents. He certainly has outgrown Baby Einstein and watches now Bob der Baumeister (in German), Wallace and Gromit and his favorite movie “Cars”. Also Max has grown quite a bit. He is now 35 inches tall and weighs 27.4 pounds. 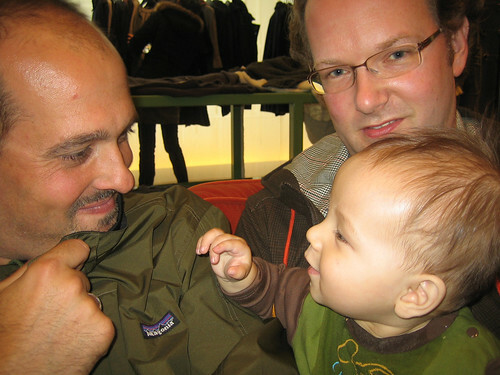 He transitioned from his small family day care to the Infant Toddler Center on Alma Street in Palo Alto. He really enjoys it there. They have a large yard and he spends a lot of time outside. He learned many new words and here are some of his favorites: Tractor, Firetruck, I know, Train, Milk, Doggie, Up and Down. This evening Max was playing in his crib while I was cleaning the kitchen (Karen is at the VMWare Field Kick-off meeting). When I came into Max’s room he was on his knees holding on to the bars of the bed. And then with some encouragement he pulled himself further up until he was standing on his feet. What a great moment. Tomorrow I try to film it if he does try to stand up again. One of the problems we face with Max is the transition he made from babyhood to toddler-hood. He went from eating almost everything you put in front of him which was pureed, to rejecting things left and right. Besides Cheerios, is there anything to satisfy the nutritional and epicurean desires of little one? So there’s no need to read consumer reports on different baby carriers. After my husband and I went through several, we settled on the Ergo Baby. We tried Native Carrier, the lastest lumbar-support version of Baby Bjorn, and also used the Moby Wrap for a while. Cons: hurts your shoulder after a while, one-sided, and only fits a certain frame size. The bottom line is that if you and your husband vary in height and most likely torso length by more than 3-6 inches, you need to buy two sling-style New Native carriers for each of you. Pros: Adjustable, and can be used by more than one person’s frame size, some shoulder support, easy to get baby in and out. Pros: One of the least expensive, lots of elasticity which replicates life in the womb, can be tied for front, back and side carrying, can be used with twins, can be adjusted for all sized-people. Cons: It’s a big long piece of cloth, so it’s always dragging on the ground in public places while you are getting it on. Can be hot in the summer, since it is thick, stretchy fabric. Pros: Pretty easy to get on, and get baby in it, extra pockets for keys and wallet, extra safety features and straps in case a closure fails, comes in different colors which stays cooler, lots of shoulder and back support to transfer weight to your hips so you can bear it for hours. The Ergo Baby Carrier is by far the best, with the Moby Wrap coming in second. However the Moby Wrap gets hotter, has stretchy fabric which can sag alot when your baby gets bigger, and drags on the ground as you are putting it on. My husband went hiking for hours with our baby with Ergo Baby Carrier and loved it. Yesterday Max had a doctor’s appointment and got his third round of vaccinations. Four shots in his legs. Today he is very tired, his legs hurt and he has a light fever of 100 degrees. On a positive note Max is growing and both his weight and his height is about average for his age (nearly 7 months). 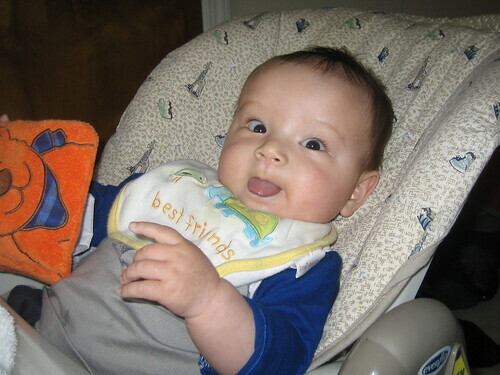 He now weights 18 pounds (8.1 kg) and is 26 inches (66 cms). Max is always up for fun. In this video he makes funny noises with his mouth. Here is another funny video with Max laughing out loud when I shake my head. Max loves water. He likes to relax in the bath tub. We also went with Max to the YMCA Pool in Palo Alto. Last time he played for 20 minutes with us in the water.